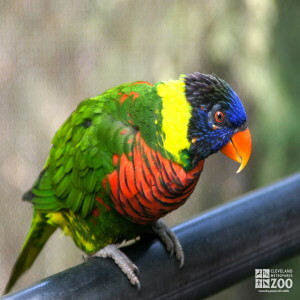 The range of the green naped lorikeet is Indonesia and New Guinea. Green napes lorikeets tend to avoid dense primary forest. They are usually seen in pairs or in small flocks, but in certain flowering trees large numbers may congregate to feed. Like all lorikeets, they are arboreal and gregarious. Each morning at day-break they fly out from their roosts and disperse to feed, sometimes travelling 30 miles or more. They fly in compact groups, screeching regularly. At food trees they clamber agilely about the outer foliage, often hanging upside-down to rifle blossoms. During the heat of mid-day there is usually a lull in activity as they sit about preening each other. After another bout of intense feeding in late afternoon, they return to their roosts. Pairing in green naped lorikeets is usually permanent. In courtship, male and female bow, bob and squirm close together, and sometimes roll over and over, playing at biting. Although the female appears to incubate alone, the male spends much time with her in the hollow, feeding her by regurgitation and roosting with her at night. The nest is usually a hollow limb or tree near water. The eggs are laid on wood dust at the bottom of the hollow. For several days after fledging, the young return to sleep in the nest. They fledge about eight weeks after hatching. Nectar, soft fruits, such as bananas, etc.